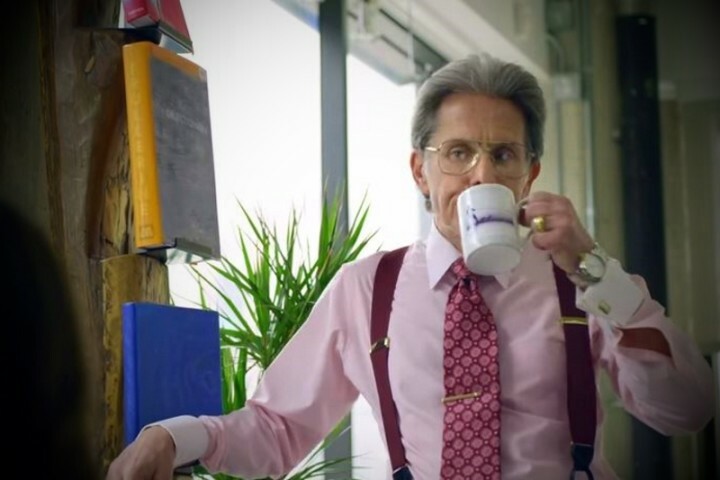 HipChat’s “Lumbergh Returns” commercials are truly brilliant. Lumbergh was a fictional character, portrayed by Gary Cole in the 1999 film Office Space. An exaggerated persona, a stereotypical caricature of corporate management, Lumbergh is the VP of the company in the movie, and he is that annoying, self-serving, egocentric, and hostile manager of the company. He is so dislikable on every front, that he is actually likable because he meets all the stereotypes of what you would expect from an Executive in Corporate America. Lumbergh’s fashion includes a two-tone shirt with French cuffs, wearing suspenders and a buckle belt –a fashion faux pas (though in full disclaimer, I was guilty of doing the suspenders with a belt thing a few times when I was younger). If you have not seen the original Office Space, you must! In the HipChat commercials, Lumbergh makes a comeback, looking good and not at all rusty –as he was in Office Space (the Movie)! At my company, Office Divvy, for group chat we’ve always used Skype. Skype was originally launched in Scandinavia, by Danish and Swedish co-founders back in 2003. Early on, it gained a lot of traction as a private-text-based-chat and a private video-chat tool mainly used by consumers, within families, and by freelancers/consultants. Later Skype added private group chat, for text-based as well as video chat. Microsoft acquired Skype in 2011 (for $8.5 billion). Within Office Divvy, between our multiple locations Skype worked great all the way through mid-2014. But when we upgraded our equipment to Windows 8.1, Skype had significant deficiencies especially for using it from the app-side of the operating system: Significant delays in pushing messages, users are in constant catch-up mode as Skype-chat-threads fail to refresh in a timely manner. Can the @Skype app be improved on @Microsoft‘s @Windows 8.1 environment? Things come with a delay, not real time. It’s a problem. @KyEkinci Hi Ky – have you talked with @SkypeSupport about that? …..hold that thought, here is one more HipChat Lumberg piece. It is very frustrating why a Microsoft product (Skype) is failing to perform on Microsoft’s own and latest operating system. One of our tech leads in the digital team at Office Divvy, Trenton, did an early download of the new Windows OS, Windows 10. And he says the issues that persist in Windows RT, 8, and 8.1 are likely to go away with the release of Windows 10 –which should be in 2015/2016 time frame. Now, if Skype fails to deliver on Windows 10, we have no option but to part ways with it and move to a different solution. Our Plan B for that included Campfire –a Basecamp product. We love Basecamp and use it very effectively among our team, so that would be a natural solution for us, from a company we already like. These brilliant HipChat commercials however totally made us love where HipChat is coming from for a solution in an otherwise undesirable market of the tech industry that is Chat. I will ask our interns to do a product review for HipChat next (as they just did one for IMGembed, and are working on one for Pixabay –both products offering Stock-Photo solutions). Do you use a Group Chat tool? Are you frustrated with Skype? Do you use HipChat –and if so, are you happy with it? Tweet us with your comment at @OfficeDivvy or leave a comment below.